Our Cased Spring Mount is available in both 25 mm & 50 mm standard deflection. 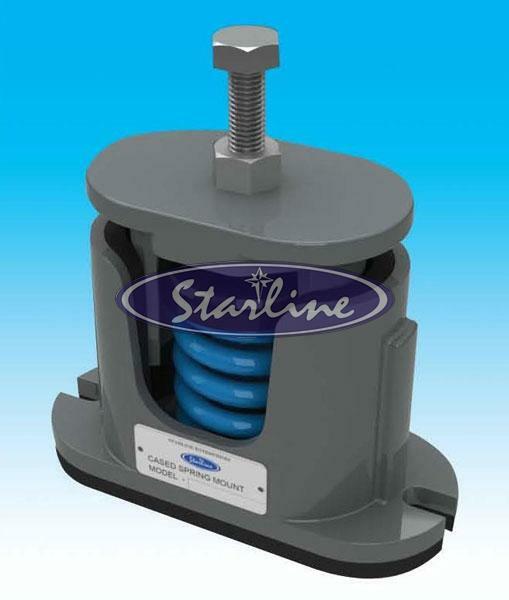 Cased Spring Mount that we manuafcture, export and supply is widely used for isolating floor-mounted sources of noise and vibration near critically quiet areas. Our Cased Spring Mount is a perfect combination of neoprene and spring. Hence, our Cased Spring Mount can isolate audible or inaudible noise and vibration produced from floor mounted mechanical equipment. It is used in reciprocating compressors, close coupled and base mounted pumps, packaged air handling units, condensing units, roof top air handling units, air cooled / water cooled chillers, centrifugal / axial fans, internal combustion engines, generators, drop hammers, punch presses up to static deflection requirement of up to 50 mm. 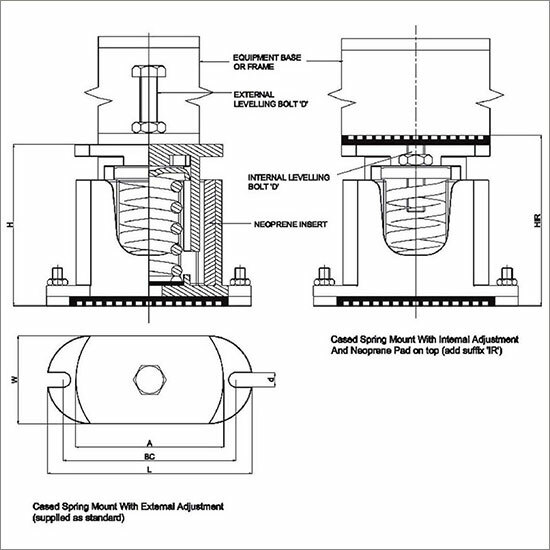 Spring elements are designed to operate without spring buckling and shall have minimum of 50% overload capacity. Spring mount has external leveling arrangements to ensure equipment is in level condition after installation. Deflection can be provided for 25 mm and 50mm at Rated Load. Provides a smooth guide for the top casing. Limits lateral movement during startups, shutdown and due to horizontal wind load. Thick Ribbed Neoprene pads are provided below the springs which provide noise barrier for high frequencies which may otherwise be tranmitted to building structures. Springs are powder coated with individual colours to facilitate identification. Springs and casings are powder coated upto 100 microns with 1, 000 hours of salt spray rating Conforming to ASTM B-117. Selection / Ordering : While calculating operating equipment weight, variables such as weight of water, weight of pipe fittings, valves etc should be taken into consideration to arrive at the actual loading on the spring. Installation Guide lines : Detailed Installation guidelines are included in the spring mount package.